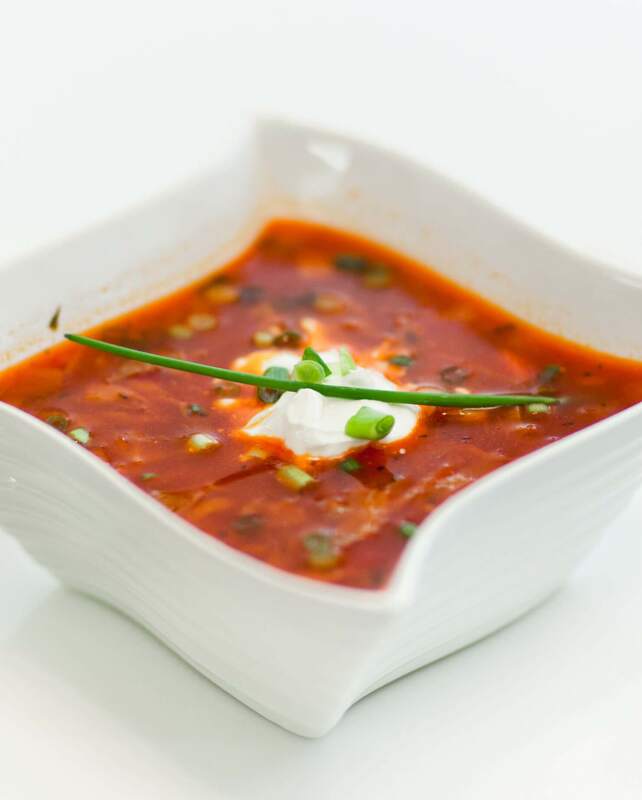 Borscht is one of the most traditional and identify classics of the Ukrainian cuisine. This is my all-time favorite soup! Borscht recipes vary slightly depending on the different regions of Ukraine and Russia – my mother was raised in central Ukraine and taught me this recipe. I have slightly changed the recipe over the years but this version is absolutely delicious! My family and friends always request I make borscht when they come over! Make sure to watch my video tutorial with step-by-step instructions! Prepare meat and heat large soup pot to medium/high heat and add splash of oil. Sear the meat until darkened, seasoning with salt and black pepper. Add beef broth, all herbs and spices. Stir together with a spoon, cover and reduce heat to low. Braise the meat for 1 hour until tender. Add the beets approximately 30 minutes into braising the meat. Meanwhile, prepare mirepoix - sauté carrots, onion, and celery in large sauté pan with oil until golden brown and translucent. Add the mirepoix to soup pot once meat has cooked for 1 hour. Add potatoes and set timer for 15 minutes once soup returns to a simmer. Cook uncovered over medium heat. prepare the sauce. Sauté the onion in olive oil over medium heat until golden brown. Add tomato puree, ketchup, water and season lightly with black pepper and salt. Simmer on low heat for 3 to 4 minutes then add to soup. After cooking soup uncovered for 10 minutes, add cabbage, parsley, scallions and fresh dill. Continue cooking until 15 minute timer ends. Remove soup from heat and cover. Let stand at least 1 hour before serving. Serve with ½ tablespoon of mayonnaise or 1 tablespoon sour cream, sprinkle of green onion and fresh toasted bread. Note: soup can be prepared a day ahead and refrigerated. The flavors will develop more overnight, resulting in a more savory soup. Simply reheat pot over medium heat. Best recipe I have found for borscht! I eyeball the seasonings but I’ve made it multiple times and my husband says it’s better than his moms 😉 woohoo! Truly delicious! First time making borsch and it was perfect!! Definitely saving this recipe and making it again. We don’t like celery but decided to go with it again since it was part of the recipe, but it did not ruin our appetites at all just added flavor! 🙂 I’m very glad you liked my recipe! I’m a huge fan of borscht, too! FIVE STARS!!!!! This was absolutely delicious! The epitome of comfort food! Thank you! 🙂 I love borscht, too! Yum. Thanks for a great recipe! I don’t usually give feedback on recipes I have tried. But I made your Borsch today and lady was it awesome! My husband is from the Ukraine and enjoys Borsch. I have tried a handful and everyone had lacked flavor and umph. This was delicious, hearty, healthy and most important flavorful. Love the step by step video and great directions. Hi there! 🙂 I’m so glad you and your husband enjoyed my recipe! I’m happy I could be of help! Thank you for watching! Thank you for this recipe. I am a beginner in the kitchen and I learn how to make food by videos. If you get a chance to make a how to video of making borscht, that would be greatly appreciated. My son made this recipe tonight. It was really good. I am not a fan of beets but this was scrumptous. I recommend it highly, also he is a novice cook but you would never know with this dish. Thank you!! Tatyana, do you use a ketchup for the sauce? You mentioned it in the instructions but i did not see you using it in the video… Also, have you tried adding beans to the soup and the bell pepper?